And yet the court which was set apart to be the keystone of the constitution insists that "the power of congress to emit bills of credit is now clearly established by decisions." In support of its assertion, it puts forward the statement, that "the power of impressing upon bills or notes of the government for money borrowed the quality of being a legal tender for the payment of private debts was a power universally understood to belong to sovereignty in Europe and America at the time of the framing and adoption of the constitution of the United States." It further insists, that the United States possess "the powers belonging to sovereignty in other civilized nations, and not expressly withheld from congress by the constitution." The court then, with unusual solemnity, sets forth its inference in this wise: "We are irresistibly impelled to the conclusion that the impressing upon the treasury notes of the United States the quality of being a legal tender in payment of private debts is * * * consistent with the letter and spirit of the constitution." In this train of reasoning the court is in error on both its propositions, the one of fact, the other of constitutional law, and its conclusion falls to the ground. In the century which elapsed between the establishment of the British constitution in 1688 and the establishment of the constitution of the United States of America in 1788, Great Britain never once "impressed" upon bills of its government the quality of being a legal tender in the payment of private debts; it never claimed the right to do so, and never performed an act which implied such a claim. Nor in all that time did any British writer on political economy, Locke or Adam Smith, teach that it would be otherwise than fraudulent or unjust to do so; nor did Great Britain give authority to any private person or to any corporation to issue bills or notes which should be a legal tender in payment of private debts. When England, unhappily for herself and for the world, entered upon its long career of ineffectual war to crush the rising efforts of liberty on the continent of Europe, the privy council of England authorized the bank of England to suspend specie payments, thus degrading the bills of the bank and ultimately introducing a long period of paper money. In reply to the reproaches of the friends of European freedom in parliament, Pitt acknowledged the undoubted illegality of the order, declaring that it could be justified only by the most urgent necessity; and the parliament of England, being then mainly in the hands of an aristocracy, hostile to reforms and progress in liberty, accepted the illegal order, in its zeal to crush the invincible strivings for constitutional liberty on the continent of Europe. So long as we remained dependent colonies, not only was the use of paper money in Great Britain unknown, Great Britain was moreover honorably careful for the purity of its coin. The great revolution in 1688 found that the silver coinage of England, which was then a legal tender, had become debased by wear and by clipping to the amount of twenty percent. In November, 1695, before the wars of that revolution came to an end, thorough provision was made by statute for remedying the ill state of the silver coin of the kingdom. The re-coinage took place under the auspices of the lord keeper Somers, who was the greatest British statesman of his time, and of Montague. They took counsel of John Locke, the wise expounder of the British revolution, by whose clear and firm advice they were instructed, and by whose writings they were supported in public opinion, when they established as the sole legal tender in payment of debts coin rated as near as possible at its own intrinsic value. John Adams loved to extol these writings of Locke as sufficient to give thorough instruction on the whole "nature of coin, credit and circulation" and to keep in memory that Sir Isaac Newton as an officer of the mint took part in the re-coinage. "The re-coinage of the gold coin in England on the same principle of justice commenced in the year 1774 and was completed in the year 1777, so writes one, who himself held high office at the time. The court falls into a stupendous error when it asserts that the power of impressing upon notes the quality of being a legal tender for the payment of private debts was universally understood to belong to sovereignty in Europe and America at the time of the framing and adoption of the constitution of the United States. We have already seen that Pierce Buffer, of South Carolina, one of its framers, asserted in the convention, "Paper money is a legal tender in no country in Europe," and his assertion was at the time of the calling of the convention strictly true. In Britain from the revolution in 1688 to 1788, no issue of irredeemable currency or debased coin as legal tender was made by the government or suffered to be made under its authority. This was thoroughly well known by the convention which framed our constitution. The assertion of the supreme court of the lawfulness of paper money in Great Britain before the establishment of our constitution finds no authority in statutes or histories. The spirit and the letter of the statute book and the spirit and opinions of all men of business in Great Britain, before the era of the French revolution, did not suffer the rising even of a thought for the issue of paper money as legal tender by the state or by its authority. A statute of 1750 peremptorily forbade the issue of any such paper in New England, and in the other colonies it was resisted through the royal prerogative. The history of France is, if possible, still more in conflict with the assertion of the court; for in France one experiment with paper money before, and one which reached its greatest excesses a very few years after, the inauguration of our constitution, were attended by the most appalling consequences. During the infancy of Louis XV., a regent who combined absolute rule with atheism in its corruptest form of a supreme worship of pleasure, forced paper money upon the nation, so that the "gainers of scandalous fortunes out of the public misery triumphed in the common ruin of the state and of commerce." Cardinal Dubois, who took part in the education of the regent and rose to be the ruling minister of the kingdom, defined the French monarchy "a government which turns bankrupt whenever it likes." The unanimous public opinion of France has pronounced the verdict which the world has confirmed: "It was an insanity of insolence thus to overturn the whole economical existence of society from eagerness for gain and the intoxication of gaming. Revolutions have sprung from less grievous wrongs." In the last years of the eighteenth century, France gradually relapsed into the use of paper money. This second fall was too late to have an influence on the framers of our constitution; and if it could have had any, must have acted as a warning. The evil came to a head when the forces of the revolution were gathered into the hands of a desperate, tyrannical, and merciless faction, and paper money reappeared under the name of assignats. The judgment of the world has been voiced by Thiers: "With the immensity of good which the French revolution has done to France and to the world, two terrible recollections weigh on its memory; they are the scaffold and paper money." And shall the insane acts of a profligate regent, or of accidental passion triumphing in the whirlwind of change, or even the ill considered but well meant impulses of patriots in the extreme perils of their country, furnish ruling precedents to the highest court of a republic of sixty millions, rather than the calm and wise, the just and patriotic decision of the lovers of their country who fashioned our constitution? It remains to consider the new interpretation of the constitution which the court has put forth. It assumes that, apart from the grants by the constitution, the United States has powers as a sovereign government; but this is the language of revolution. If the nine men to whom the constitution and the laws intrust the executive power, the president, his seven assistants, and the vice president, were to agree together to exercise powers as inherent in themselves because the United States are a sovereign government, they would be guilty of a conspiracy. The Stuarts claimed powers as inherent in them as sovereigns; their rashness ruined their own dynasty, not the constitution of England; it was the happiness of Great Britain that the usurpations of the Stuarts were resisted by the great English lawyers and by England's highest courts of law. The constitution of the United States does not create them a sovereign power in an unlimited sense. Our union in its foreign relations presents itself with all its states and territories as one and indivisible; a garment without a seam; but at home we are states in union. Within the limits of the states, the government of the United States of America has no powers but those that have been delegated to it; some powers are distributed, some of them going alone to the United States, some to each several state, and some equally to both. To prove the immensity of the error into which the court has fallen, no witness shall be summoned but from those to whom it must feel willing to pay respect, if not deference. At the moment when the constitutional convention in Philadelphia sent to the states and through the press to the people the result of its deliberations, when its framers were hopeful and yet anxious, when the first impression that should be made might sway opinion from one end of the land to the other, it was resolved to hold in Philadelphia, as soon as possible, a public meeting of its citizens; and James Wilson, "one of the delegates of Pennsylvania to the constitutional convention," and one of the most efficient members of that body, was selected to explain to the meeting the principles of the constitution of the United States. Accordingly, he "marked" before the meeting what he called "THE LEADING DISCRIMINATION" of the constitution of the United States from their separate state constitutions, and these are his words: "In delegating federal powers, the congressional authority is to be collected, not from tacit implication, but from the positive grant, expressed in the instrument of union. Everything which is not given is reserved." And Wilson was one of the three with whom Washington constituted the first supreme court of the United States. Roger Sherman, high in judicial station and in judicial authority in Connecticut, and Oliver Ellsworth, of the same state, the great statesman, who, almost unaided, framed the law for organizing the supreme court, and became by the choice of Washington its chief justice, within ten days of the close of the convention, wrote from New London in their official report to the governor of their commonwealth: "The additional powers vested in congress extend only to matters respecting the common interests of the Union, and are specially defined; the particular states retain their sovereignty in all other matters." On the fourth of January, 1788, Alexander Hamilton, a representative of New York in the same convention, informed the public through the press, that "as the plan of the convention aims only at a partial union or consolidation, the state governments would dearly retain all the rights of sovereignty which they before had, and which were not, by that act, exclusively delegated to the United States." Charles Cotesworth Pinckney, coming fresh from the constitutional convention, in which he acted a chief part, on the seventeenth of January, 1788, gave information to his constituents in words of no uncertain meaning: "It is admitted on all hands that the general government has no powers but what are expressly granted by the constitution; and that all rights not expressed were reserved by the several states." Massachusetts, by its convention for accepting the constitution, "explicitly' declared, that all powers not expressly delegated to congress are reserved to the several states, to be by them exercised;" and sought to place this declaration in the constitution itself. 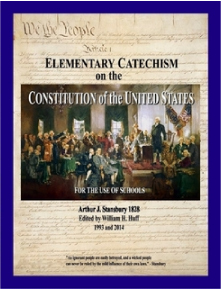 The congress of the United States, within the first half year of its existence, laid the declaration before the states, and in less than nine months, without an adverse vote of any one state, the constitution received into itself, as the true interpretation of its meaning, that "the powers not delegated to the United States by the constitution, nor prohibited by it to the states, are reserved to the states respectively or to the people." The present supreme court may suffer themselves to be convinced with the least reluctance, if, in further citations, out of an endless number of authorities, I confine myself to quoting the opinions of the earlier members of their own court, of themselves and of lawyers who had been selected for their places. James Iredell, of North Carolina, who was seated upon the bench of the supreme court by Washington within the first year after his inauguration, had contributed largely to the establishment of the union, and as a judge and as a man left a name without a blemish. His words of 1791 agree with these which he delivered from the bench in 1798: "It has been the policy of all the American states, which have, individually, framed their state constitutions since the revolution, and of the people of the United States when they framed the federal constitution, to define with precision the objects of the legislative power, and to restrain its exercise within marked and settled boundaries." In 1819 chief justice Marshall, the successor of Ellsworth, placed on record the opinion of himself and the court: "This government is acknowledged by all to be one of enumerated powers. The principle, that it can exercise only the powers granted to it, would seem too apparent to have required to be enforced by all those arguments which its enlightened friends, while it was depending before the people, found it necessary to urge. That principle is now universally admitted." In 1804 Marshall had given a similar opinion. In the January term of 1837, Roger B. Taney, Marshall's successor, sat on the bench between Joseph Story and Smith Thompson, when the unanimous opinion of the court, which was read by John McLean, of Ohio, contains this sharply drawn description of the legislative powers of congress: "The federal government is one of delegated powers. All powers not delegated to it, or inhibited to the states, are reserved to the states, or to the people." The next chief justice, Salmon P. Chase, in the December term, 1869, delivered this opinion of the court: "The constitution is the fundamental law of the United States. By it the people have created a government, defined its powers, prescribed their limits, distributed them among the different departments, and directed, in general, the manner of their exercise. No department of the government has any other powers than those thus delegated to it by the people. All the legislative power granted by the constitution belongs to congress; but it has no legislative power which is not thus granted. And the same observation is equally true in its application to the executive and judicial powers, granted respectively to the president and the courts. All these powers differ in kind, but not in source or in limitation. They all arise from the constitution, and are limited by its terms." Since the death of Chase, the court has had occasion to express once more its opinion on this subject. In the October term of 1882, when it was composed identically, man for man, of the very same nine men that constitute it now, it referred to the opinion of Marshall which I have cited, and adopted it without reserve as its own. For itself it added concisely and excellently well: "The government of the United States is one of delegated, limited, and enumerated powers. Therefore every, valid act of congress must find in the Constitution some warrant for its passage." The opinion of the court of March third, 1884, in the case of Juilliard versus Greenman, is therefore in flagrant antagonism to the constitution of the United States and to the repeated, continuous, and unanimously given, and justly respected interpretations of the constitution by the court itself, under a succession of chiefs without a break. The new departure, which puts the constitution out of sight, was announced to the world as the opinion of eight judges against one; but it must be remembered and told for the instruction of the present generation and for posterity, that this approach to unanimity was accidental. On the death of Chase, it is of my knowledge that president Grant desired to place upon the bench as his successor a member of his cabinet, Hamilton Fish, in whom he is known to have reposed the greatest trust. That statesman has the character of fidelity to his convictions of constitutional truth, and his friends know well that on the question which is now under consideration, the words which follow have ever formed his opinion: "The constitution of the United States gives to the general government the powers of a sovereign nation in its condition as one among the 'Family of Nations;' but, then, only in its dealings and relations with foreign governments. In its internal relations and in its dealings with the several states of the union, and with its own citizens, the government of the United States is one of delegated and enumerated powers, forbidden the exercise of very many, and among them of some of the most important and frequently exercised powers of sovereignty. In their internal relations, albeit supreme within its prescribed sphere of action, the government of the United States is far, very far removed from the powers of a sovereign state. The legal tender legislation of congress is of purely internal and domestic force and operation. It ceases to be operative precisely when the sovereign powers of the government begin, and can rightfully invoke no sanction or authority from those powers of sovereignty." Further: While the seat of the chief justice of the United States remained vacant, Roscoe Conkling, of New York, was requested and urged, though in vain, by president Grant to accept this position, which is for life, and is the highest position in one of the three great coordinate departments of the government of the United States; more recently, on occasion of a vacancy, he has been again entreated by the appointing power to assume the functions of a member of the court, and has again refused. His opinion on the point of constitutional law which is now under discussion, was pronounced in public before he was first designated for the high office of chief justice, and has never changed. It runs thus: "The constitution of the United States is an instrument of delegated and enumerated powers, and congress has no powers except those which the constitution confers. In looking for a power in the constitution of a state, the question usually is: has it been taken away or forbidden? But, in looking at the federal constitution, the question is: has the power been given? If it is not there, there is an end of the matter." It is well known to the winter residents of Washington, that in the early part of 1882, the executive of that day desired to place on the supreme bench George F. Edmunds, then and now a senator from Vermont; and his wish, supported by the very. strong and very general concurrence of opinion, was defeated only by the refusal of the senator himself. But on the question which we are discussing he has given this opinion, which for terseness and clearness and correctness need not be excelled: "The government of the United States has no power of inherent sovereignty, but only such sovereign powers as were delegated to it by a written constitution, which carefully and expressly declared that all powers not delegated by that instrument were reserved to the states and people. The power to create a legal paper currency, if it exist at all, must exist by force of a delegation, and not by force of inherent sovereignty." But why do we ransack the scores of volumes of the reports of the courts? The states themselves and the nation are the witnesses to the meaning of the constitution which they formed and ratified and have upheld for nearly a century. Every one of the parties which have ever been formed in the United States, the debates of every session of congress, every commentator upon the constitution, at home or abroad, has set forth that our government is one of limited powers. And not only so, the voice of the imitative civilized world, watching our career, has followed our example, and kingdom after kingdom has like ourselves established written forms of government, in order to define and establish the lines within which every public authority should move, every branch of the government, every delegated political power should confine its action. And are these sublime evidences of the advance of civilization to be thrown out of sight? The court of the United States has set itself in conflict, not with the constitution and the people of the United States alone, but with the voice of all the nations which have successfully aspired after free institutions and well defined governments throughout the world. Holland, Belgium, France, the several states of Germany by themselves and as united in one German empire, all bear their testimony to what we have achieved, and they have made their own. Like the heralds at the Olympic races, when the swift chariots passed beyond the boundaries marked out for their course, all these states lift up their voices to call the court back within the limits of their path of duty, that the very life of constitutional government may not perish among men.